History: Although an intimidating race with a dangerous plan, the Gastropods are mainly remembered due to them being the first enemy faced by a new Doctor; in their case, the Gastropods were the first enemies of the newly-regenerated Sixth Doctor. A race of massive slugs, the Gastropods were natives of the planet Jaconda, leaving slime trails that hardened like concrete at an exceptionally rapid rate when they moved. According to legend the Gastropods were created when the Queen of Jaconda offended the sun god, the god sending the Gastropods as a punishment, but when he witnessed the devastation they caused the sun god sent a drought that killed the Gastropods. Whatever the truth of their origin, the Gastropods were believed to have become extinct long ago, but at least one Gastropod egg managed to survive, eventually hatching into the Gastropod that would be known as Mestor, who possessed powerful telepathic powers, resulting in various other Gastropod eggs being laid (Although Mestor was apparently in full control of the other Gastropods, to the point that he was the only one shown to be capable of verbal communication). At the time, Jaconda was ruled by Azmael, a Time Lord and former coordinator of the Matrix, who was also an old friend and teacher of The Doctor's from his time at the Academy ("Divided Loyalties"), with Mestor ensuring Azmael's allegiance by offering to 'help' him deal with Jaconda's current environmental problems. Their plan to deal with Jaconda's current famine was apparently to move the two smaller outer planets closer to Jaconda's sun while also shifting them into a different time phase, thus allowing them to receive more heat and make them suitable locations to grow new crops. To this end, Azmael abducted mathematical geniuses Romulus and Remus Sylveste, whose notorious skills in mathematics were needed to perform the necessary calculations to stabilise the planets in their new orbits while also shifting them out of temporal phase with each other, allowing them to exist in the same orbit without risking crashing into each other. Azmael's plans were revealed to The Doctor when the newly-regenerated Sixth Doctor and his companion Peri landed on the asteroid Titan 3 at the same time as Azmael briefly stopped there with the twins. 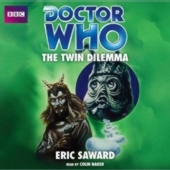 Pursuing Azmael to Jaconda after learning about the abduction, The Doctor witnessed the planet's desolate state and learned of his plan, simultaneously investigating the palace hatcheries to reveal a large collection of Gastropod eggs. When The Doctor tried to examine one of these eggs by cutting it open with a laser, he realised Mestor's true plan when the previously-dormant egg began to move in response to the laser's heat; when the planets crashed into Jaconda's sun - it being impossible for them to maintain the orbit required for Azmael's plan to work due to their small size, The Doctor speculating that Azmael had overlooked this flaw due to his sentimental attachment to Jaconda - the resulting solar eruption would not only destroy Jaconda, but cause the eggs to be spread out over a galactic range, allowing the Gastropods to dominate all life within the 'blast radius' as the heat of the exploding sun accelerated their gestation and led to them hatching. Refusing to allow this to happen, Romulus and Remus were able to buy time by deleting their just-completed equations - thus ensuring that Mestor couldn't kill them as they were needed to recreate their work - giving The Doctor and Azmael the chance to confront him directly. Attacking Mestor with acid, The Doctor was able to destroy his body, but Mestor subsequently used his telepathic powers to transfer his mind into Azmael's body. Although The Doctor offered to link minds with Azmael so that they could work together to drive Mestor out, Azmael knew that The Doctor's mind was still too addled by his recent regeneration for him to be able to maintain an effective defence against Mestor, and so triggered his own regeneration... which, since he was already on his thirteenth life, meant that he died with Mestor, Azmael surviving as himself long enough for The Doctor to assure Azmael that he was always his favourite teacher before his friend and mentor died for good.